Whether the mouse uses a laser or ball, or is wired or wireless, a movement detected from the mouse sends instructions to the computer to move the cursor on the screen in order to interact with files, windows, and other software elements. Even though the mouse is a peripheral device that sits outside the main computer housing, it's an essential piece of computer hardware in most systems... at least non-touch ones. Computer mice come in many shapes and sizes but are all designed to fit either the left or right hand, and be used on a flat surface. The standard mouse has two buttons toward the front (to left-click and right-click) and a scroll wheel in the center (to quickly move the screen up and down). However, a computer mouse can have anywhere from one to several more buttons to provide a wide variety of other functions (like the 12-button Razer Naga Chroma MMO Gaming Mouse). 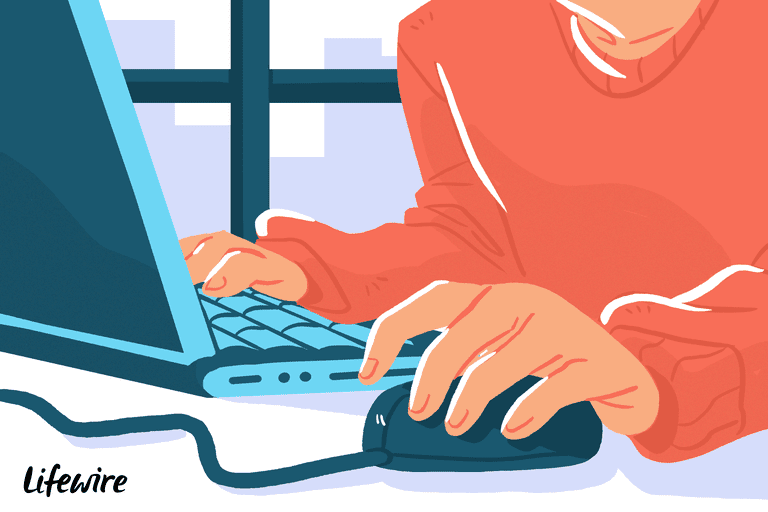 No matter what type of mouse is used, they all communicate with the computer either wirelessly or via a physical, wired connection. If wireless, mice connect to the computer either via RF communication or Bluetooth. An RF-based wireless mouse will require a receiver that will physically connect to the computer. A Bluetooth wireless mouse connects via the computer's Bluetooth hardware. See How to Install a Wireless Keyboard and Mouse for a short look at how a wireless mouse setup works. If wired, mice connect to the computer via USB using a Type A connector. Older mice connect via PS/2 ports. Either way, it's usually a direct connection to the motherboard. Like any piece of hardware, a computer mouse works with a computer only if the proper device driver is installed. A basic mouse will work right out of the box because the operating system likely already has the driver ready for installation, but special software is needed for a more advanced mouse that has more functions. The advanced mouse might work just fine as a regular mouse but it's likely that the extra buttons won't function until the right driver is installed. The best way to install a missing mouse driver is through the manufacturer's website. Logitech and Microsoft are the most popular manufacturers of mice, but you'll see them from other hardware makers as well. See How Do I Update Drivers in Windows? for instructions on manually installing these types of drivers in your specific version of Windows. However, one of the easiest ways to install drivers is to use a free driver updater tool. If you go this route, just be sure the mouse is plugged in when you start the driver scan. Some drivers can be downloaded through Windows Update, so that's another option if you still can't seem to find the right one. Basic options for controlling the mouse can be configured in Windows through Control Panel. Search for the Mouse Control Panel applet, or use the control mouse Run command, to open a set of options that let you swap the mouse buttons, pick a new mouse pointer, change the double-click speed, display pointer trails, hide the pointer when typing, adjust the pointer speed, and more. A mouse is supported only on devices that have a graphical user interface. This is why you must use your keyboard when working with text-only tools, like some of these free bootable antivirus programs. While laptops, touch-screen phones/tablets, and other similar devices don't require a mouse, they all use the same concept to communicate with the device. That is, a stylus, trackpad, or your own finger is used in place of the traditional computer mouse. However, most of these devices support using a mouse as an optional attachment if you'd prefer to use one anyway. Some computer mice power down after a certain period of inactivity so as to save on battery life, while others that require a lot of power (like some gaming mice) will be wired-only to favor performance over the convenience of being wireless. The mouse was originally referred to as an "X-Y position indicator for a display system" and was nicknamed a "mouse" because of the tail-like cord that came out the end of it. It was invented by Douglas Engelbart in 1964. Prior to the invention of the mouse, computer users had to enter text-based commands to do even the simplest of tasks, like moving through directories and opening files/folders.